Customers of Dragonpay-accredited merchants can now pay for their online purchases at any of M. Lhuillier’s 1,400+ branches nationwide. Branches are open 7-days-a-week with some operating 24 hours a day. Just follow the easy steps outlined below to complete your payment. Go to any M. Lhuillier branch and tell the staff that you will be making a Bills Payment (not a remittance). 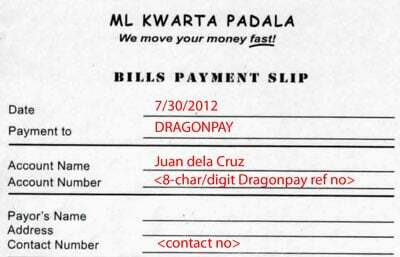 You will be given a Bills Payment Slip to fill-up (see sample below). Make sure your Dragonpay reference no. is correctly entered in the Account Number field. Make sure also that the cashier encodes it correctly. A wrong account number can cause your transaction to remain unvalidated. Please provide a valid Contact Number where we can reach you in case there are problems with the validation. The other fields (ex. Payor’s Name, Address) are not really necessary but provide them for completeness. Hand over your slip and cash (no checks please) to the cashier. The cashier will charge you an extra fee for their service (see below table). Dragonpay subsidizes or absorbs the first Php 10.00 of the fee so you only have to pay the net fee due over-and-above the actual online purchase amount. Below is an illustration of how the extra fee is computed based on sample purchase amounts of PHP 1,000 / 12,000 / 50,000 / 80,000. Wait for our confirmation email. For now, we process M. Lhuillier payments morning of the next day. In the future, we will have several cut-off so that payments made earlier in the day may be processed within the same day.